Now that you know the three undefined terms, we can take our geometry vocabulary a little further. Let's now add the three basic terms segment, ray, and angle. A segment is an easy term for many students because it is very similar to what they already know. A segment is what you would ordinarily think of when you drawn a line on a piece of paper. In other words, a segment is a piece of a line. It begins at one point on the line, and ends at another. These points are known as the endpoints of the segment. *Remember, a line extends forever; a segment ends so it has endpoints. A ray is a combination of a line and a segment. It starts at one point, again know as its endpoint, and extends forever in ONE direction. a segment ends at two points. These three terms are often grouped together because of their similarities, but make sure you also understand the differences. In building our geometry vocabulary, the term angle is very important. Like many geometric definitions, it sounds a lot more complicated than it really is. Formally: An angle is formed by the intersection of two rays with a common endpoint. 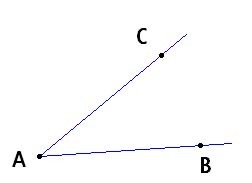 Informally: When two segments (or lines or rays) intersect, they form an angle. When an angle is formed, it has some important parts. To help you to understand the different parts, take a look at the picture and color-coded descriptions below. The blue line segments (they are technically rays, but that's ok) are the sides of the angle. The point where the segments intersect (touch each other) is known as the vertex of the angle. The yellow inside of the angle is known as the interior, and the grey outside of the angle is known as the exterior. Hopefully these terms make sense to you. Think of a house, the inside is known as the interior. The same thing is going on here. A segment is named with its two endpoints and a bar written over top of it. Take a look at the segment with endpoints at A and B. This segment would be written as and spoken as "segment AB." A ray is named in a similar fashion. Name the endpoint first and then name another point on the ray (since it extends forever you can pick any one of them). Finally, draw a line with one arrow over top of it. This ray would be written as and spoken "ray XY." An angle is named by 3 points. The first point is on one side, the second point is the vertex, and the last point is on the other side. This angle can be named as either or , but A must be in the middle because it is the vertex! The symbol in front of the letters is known as the angle symbol and should be used when you want to name an angle. Do you now know these three basic geometry vocabulary terms? It might see a little overwhelming right now, but that is ok. Geometry all continues to build on itself - do you see why we needed to start with the 3 undefined terms before we could get to these basic vocab terms? Once you have made it a little further in geometry career, come back to the beginning and see if this stuff makes a little more sense. You'll be amazed how much easier it gets the second time around. For more geometry help, return from basic geometry vocabulary to other free geometry help subjects, or to the Grade A homepage.